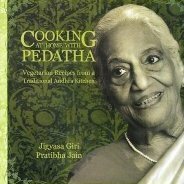 Cooking At Home With Pedatha, Jigyasa Giri and Pratibha Jain. I was at once surprised, honored, and delighted to receive this lovely, authentic recipe from Pedatha’s kitchen, especially for our Toor Dal Jihva collection! ‘Peddha Atthayya’ ~ eldest aunt (father’s sister) in Telugu. our own sense of belonging and inspires the best in us. My sincere thanks and best wishes to you all, authors and auntie alike, and to dearest Indira, who guided my first faltering steps down this little path that has become such a wonderful journey. And now, here are Jigyasa, Pratibha and Pedatha! “This South Indian dish from Andhra Pradesh is known as chaaru – which means rasam in Tamilnadu, and can be roughly translated as ‘soup’ in English. However, a soup is had at the beginning of a meal, but chaaru is had with rice. We have featured this recipe in our cookbook “Cooking at home with Pedatha”. We have other favourite recipes with Toor dal in our book, but since Toor dal is the queen of the day at Linda’s blog, we have decided to submit this chaaru – what makes it special is that it uses powdered red gram (Toor dal) instead of the usual boiled gram. Its sweetish flavour enhances the other spices. The protagonist of our book, Pedatha says that for an extra special touch, you can add a small stick of cinnamon and a tsp of chaaru podi. Quick and easy to make, this chaaru is very good for constipation and digestive problems”. 1) Measure 6 cups of water in a deep vessel and add all the ingredients except the tempering and coriander leaves and bring to a boil. Allow to simmer for 10 more minutes. 2) Heat the ghee and pop the mustard. Add the cumin and asafoetida and pour this tempering into the chaaru. Garnish with coriander leaves. Serve hot with steamed rice or enjoy as a soup. Above recipe is copyright and reprinted courtesy of Jigyasa Giri and Pratibha Jain, from Cooking at Home with Pedatha, all rights reserved. Hrudayapurvaka dhanyavaadamulu to you too Linda! What a wonderful contribution from Pratibha and Jigyasa. lovely! i am getting this book this weekend and trying out most of the recipes soon! I have this wonderful book. and I have tried many wonderful authentic Andhra recipes. Pedatha reminds me of my grandmothers. oh, yeah, we’ve made this and blogged about it. absolutely lipsmacking. I feel that the above was very nicely said. brings a lot of feeling and vibrations, since it all seems like family time. Our own relationships. feelings of caring, guilt, bridged and unbridged bonds within the fragment of our shell – that is our family. Reg. inspiring the best in us – this was like the icing on the cake – since the whole thing was sounding so positive. It is like discovering our own inner space – a warm feeling ! Festivals, ceremonies, reunions bring nostalgia to the fore. I can imagine the wonderful flavours in this sweet-sour-spicy rasam.